After YEARS of waiting, layouts are finally complete for The Cat is Dead: The First Collection. The 20-page self-published zine is going to print & will be available online & in select comic shops in January. Stay tuned to this website for more info . . .
And most of all, THANK YOU for your patience! I wanted to cross out "after" and write "during" - that would have really thrown her off! KEEP UP WITH THE POOPS! 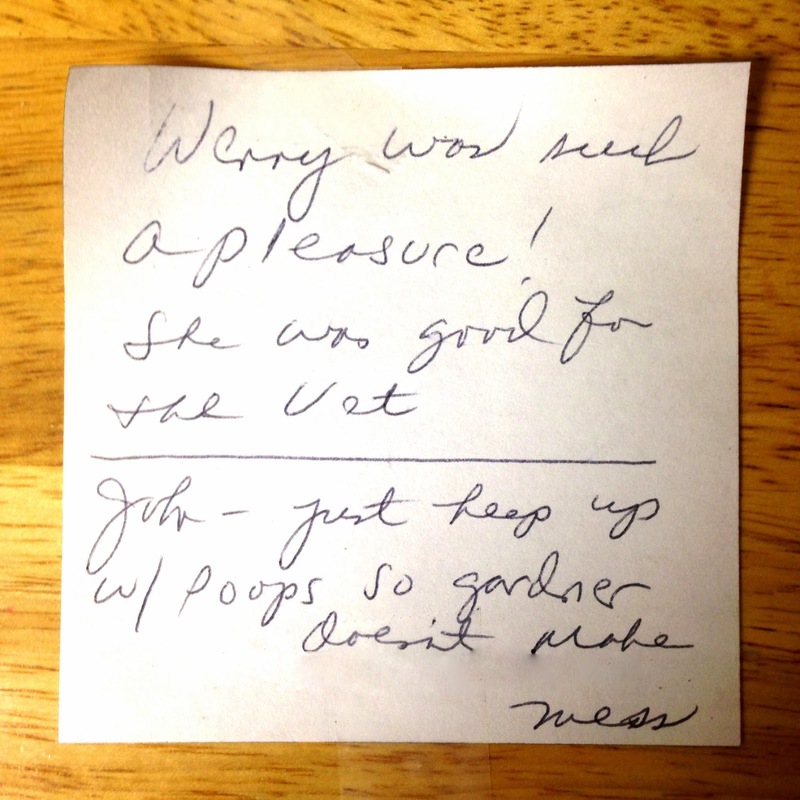 My Mom took our pup to the vet and left us this note. 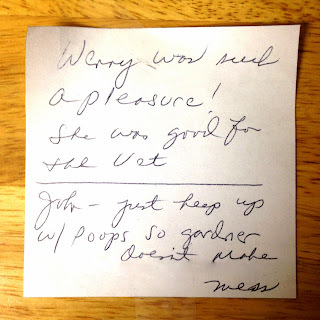 For some reason, in addition to telling us how well-behaved our dog was, she felt the need to remind us to clean up the dog "poops" in the yard "so the gardener doesn't make a mess." Important to note is the solid black line that visually separates the two thoughts . . . I might have missed the memo, but is there a rise in handtruck theft these days? Sometimes you have to be reminded how to close the fridge. And sometimes you have to be reminded again when you're leaving the house! Yeah, there was a bag of raw chicken hanging on the door knob of my car the other day, to give to my dog of course! A lot of people have been emailing asking to see some shots from the house. Here are a few from the kitchen . . .
First off, always remember to "keep calm." -- and clean the oven. Don't forget to "do bills." "To-do" tasks and reminders line the walls . . . Box on the right filled with take-out menus. Sometimes I close my eyes and pretend they are a nice plant or flower vase. I am 33 years old and grew up in a very small town on the South Shore of Long Island, NY. I am a writer, collector, and artist working in online advertising. This collection of notes is respectfully dedicated to one of the most unique, eccentric women I have ever known -- my mother. Thanks for reading! WHAT IS THE CAT IS DEAD? For the past 20 years, I have been collecting hand-written notes from my Mom. I first started saving them in high school in the early 90’s. Before long, I had an entire shoe box filled. Yeah, yeah, I know what you’re thinking . 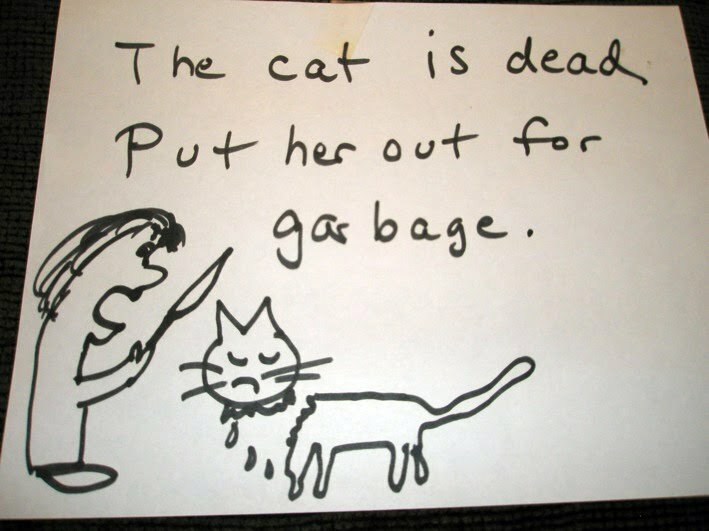 . .
What does all this have to do with a dead cat?! Our family had a house cat named Silky. My Mom got her in the late 80’s when she was just a kitten, from the gutter in the alley behind a hair salon. 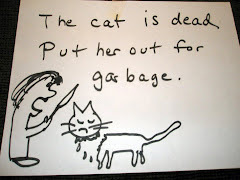 The cat, in my mother's mind, was a nuisance for most of her life with us. 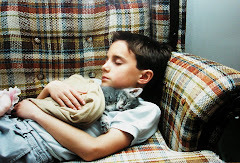 But my little sister and I loved our cat dearly - she was a member of our family. Later, in her old age, Silky started uncontrollably puking, peeing, and pooping all over the house. I came home one day & discovered that Silky had puked on the carpet in the living room, seconds after my Mom had it shampooed. There was a note on the kitchen table . . . This was the note that started it all . . . 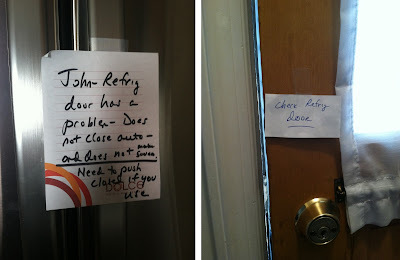 Since the early 1980’s, my Mom has been leaving notes to the entire family.
. . . and she still does to this very day! 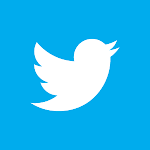 Click the birdie above to follow The Cat is Dead on Twitter! Thanks for visiting The Cat is Dead! Tell your friends!